It took me much longer than usual to write my new blog post, which is primarily down to health reasons. An inflamed elbow could, in theory, be a blessing if you want to see films. What do you need your arm for? The problem was that Ì couldn’t take notes over the course of three hours, as it would have been the case with my very first Angelopoulos film. I had to give my arm a rest, all the while trying hard to progress with The Art(s) of Slow Cinema magazine, which is almost, almost, very nearly done! There isn’t always a particular reason for why certain directors are not yet in my A to Z list. Theo Angelopoulos, from Greece, is one of those filmmakers that have been named in the context of Slow Cinema pretty much from the beginning. Yet so far, I have never written about him. I have been asked about the reasons for this several times before. There has never been anything in particular which made me avoid Angelopoulos until now. Once my PhD took a turn towards the films of Lav Diaz, I felt that I had to focus on those first of all, or on others that seemed slightly similar. This is not only a beautiful shot, albeit it needs to be seen in movement in order to be appreciated properly. The Weeping Meadow is a film, which continues where Andrei Tarkovsky left off with The Sacrifice. In this very film, Angelopoulos is the most Tarkovskian of Slow Cinema directors. 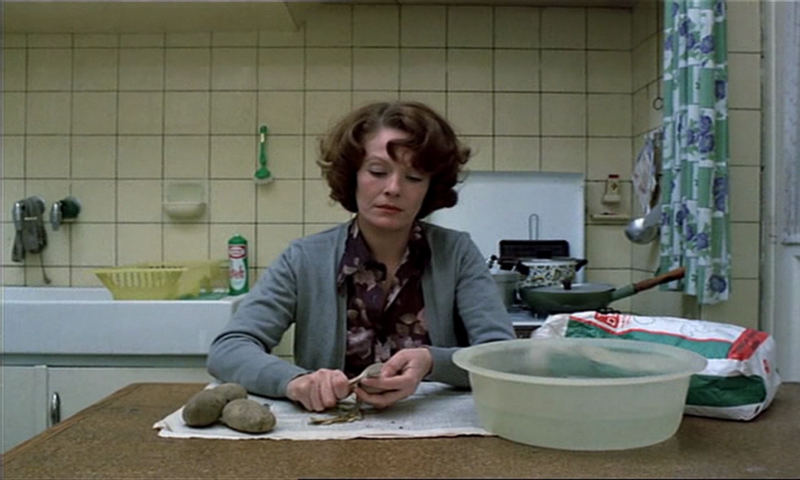 All slow films are, in one way or another, put into the context of Tarkovsky’s “sculpting in time” concept. Especially at the beginning of writing about Slow Cinema, the Tarkovskian philosophy was everywhere. This has receded quite a bit in the last two years or so. Perhaps, critics have realised that Tarkovsky itself isn’t as present in most slow films as they had wished for. Of course, Slow Cinema as a genre, or whatever you might call it, is indebted to the work of Tarkovsky, but the Russian director wasn’t the only inspiration. He was a late inspiration that, I believe, helped Slow Cinema reach its fulfilment. But let’s return to Angelopoulos whose The Weeping Meadow is the first part of the director’s trilogy about modern Greece, a trilogy he could sadly not finish. I’m almost sure that I might create a neologism here if I said that Meadow was a “wide” film. Every scene feels like a deep inhale, visuals that fill and feed your lungs. Do we ever exhale? To be honest, I’m not sure. Meadow felt like a series of inhales, or even one very long, three-hour long inhale. Scenes are wide-angled, and even if the frames are tight from time to time, a delicate zoom out allows us take a breath. Angelopoulos’s visual mark is width more than anything. It is about taking a step back, about taking a look at the wider picture. There is something about the smooth and delicate camera movement and its angles that makes it feel perfectly organic. It certainly is, after Tarkovsky’s Mirror, the most explicit example of Daniel Frampton’s ‘filmind’, which I have mentioned several times on this blog already. The particular camera movements, which Tarkovsky had used in Mirror, for example when he explored Andrei’s seemingly empty flat, find their perfect copy in Angelopoulos work. Delicate zoom outs or zoom ins, a searching camera that very much embodies a searching person – one cannot deny that Angelopoulos created a major homage to the Russian director. And then there is The Sacrifice, Tarkovsky’s last piece which I considered to be a cinematic theatre play. The entire nature of the setting, of character behaviour, of dialogue – nothing really felt as though the aim of the film was to create a film. Rather, the aim seemed to have been to merge different art forms and their different natures, create a crossover and thereby create something new, or, if not that, showing how similar all art forms really are. Meadow has very little of a film. The screen grab above, of Spyros, an elderly man – lonely, depressed – who has been betrayed by his son, who fled with his own wife-to-be, is the most explicit statement of it, and the scene didn’t come as a surprise in terms of its aesthetics. It was the fitting culmination of the feeling I had had about the film until then. I’m allergic to films in which actors and actresses stage something from their life, instead of live the role they’re meant to embody. Yet, Meadow falls into another category. The perfect orchestration between wide, observational camera movements and the specific theatre-like play of the characters creates a special cinematic experience, an experience that questions the strict categorisation of art forms and, therefore, also of audiences. Angelopoulos’ story isn’t extraordinary as such. We follow Eleni, adopted as a young girl by Spyros and his wife, who, at the beginning of the film, flee the Russian Revolution and who return home to Greece. Much later, Eleni becomes Spyros chosen one, but his son, Alexis, runs away with Eleni. The two, always on the run, become a prism through which the viewer travels through Greek history up until the Greek civil war. It is a story that has been told dozens of times, by people from other countries, from other regions, other backgrounds. The theme of seeking refugee during political upheaval is very much the core of the film, interspersed with love scenes that are almost too much. It is a traditional film, with a traditional structure, and yet Meadow is standing out from those classical treatments of love, change and refuge at times of war. Of course, there are the specific contemplative aesthetics, which help the film to stand out. Without them, the film would have been forgotten by people long ago. Essentially, Meadow‘s downside is its horizontal development. It is a look at the outside of things, at the outside of characters and their lives. Angelopoulos didn’t create a psychological film. He didn’t allow the film to develop vertically, i.e. we never really get into the characters. It is a “surface film”, a piece that stays on the surface, but Angelopoulos covers this weakness so cleverly, so breathtakingly, so rigorously that there is never really a doubt about its power and its strength. I’m certainly looking forward to seeing the second part of the trilogy. When I was still in primary school, at the sweet age of nine, and had no idea that I would become a slow fanatic one day, someone wrote a book on contemplative cinema. That someone was Andrew Horton, and it appears rather strange to put the concept of contemplative cinema into the pre-2000 era. After all, the concept has largely been accredited to Harry Tuttle, and I wonder whether it’s again just one of those knee-jerk things, or whether someone has actually done a bit of work to see that Tuttle was not the person to come up with it. Even though this is by no means a competitive race about who’s first (it’s useless in a slow world anyway), it is important to put things straight before a proper debate on Slow Cinema can take place. Horton’s book on the films of Greek filmmaker Theo Angelopoulos is one of those rare specimens on the market. I’m surprised to see so little work on Angelopoulos, and nothing substantial has come out of (especially!) academic film studies since Horton’s book in 1997. This is on the one hand surprising because Horton’s book is in no way complete. It is, rather, a nice introduction to the films of the Greek director, who, as I have figured while reading the book, shares quite a few similarities with Lav Diaz. On the other hand, contemplative cinema – in whatever way, from whatever director – is not exactly a subject film scholars are fighting over. There is a comparatively big hype around Slow Cinema at the moment – since 2010, in fact, when Romney used the term ‘Slow Cinema’, which in fact he did as far back as 2004 but this is generally ignored – but I do not see this as a pointer to a persistent academic interest. It’ll be put aside pretty quickly again, and scholars will move on to something else. As I said before, Horton’s book serves as an interesting medium to discover the films of Angelopoulos. It’s one of my big faults that I have so far only seen one film by him, but this shall change in future. I’m a bit behind with the ‘classics’. The first part of the book is almost excellent, I would say. Horton puts Angelopoulos’s films into the wider context of world cinema, starting with Greek cinema, then expanding to the French New Wave, Italian Neorealism, cinema in the Balkans and East Europe, and he even points to similarities Angelopoulos’s aesthetics share with Japanese films of the early days. While this part is an interesting read, the in-depth analysis of similarities the Greek director shares with other filmmakers discredits his own achievements. It reads as though Angelopoulos’s films are an amalgamation of everything that has been before, which, in some ways, they are. But there is little emphasis on the director’s own approach to cinema. This reminds me of what Lav Diaz told me when I asked him about influences. His work, as so many other slow films, are linked to Italian Neorealism, for instance. Diaz said he watched a lot of those films, but he would not consciously quote them. He’s not consciously influenced by, say, Rossellini. That means, to me, that I should focus on his films as what they are – his films. This is a major issue in the studies of Slow Cinema. One argument you will find pretty much everywhere is the influence of Italian Neorealism. I’m always surprised to read this. The use of long-takes, non-professional actors etc goes back to the very beginning of film history. Therefore, Slow Cinema is not similar to Italian Neorealism. It is simply cinema, a cinema that has always been there, long before neorealism. What I particularly liked about Horton’s book is the dive into the similarities of Angelopoulos’s aesthetics and Byzantine art. It’s exactly what resonates with my own thoughts and experiences, namely that Slow Cinema is generally indebted to static art, mainly painting. Not so much the aesthetics, but the way the viewer has to approach the films or static art respectively. This becomes clear in Horton’s analysis. In this context, Horton also speaks about a “cinema of meditation”, which is a fitting description not only of Angelopoulos’s films. It could be applied to all slow films. When I read through the book, I felt as if little new material has been generated in regards to Slow Cinema. The vast majority of arguments have been there before. It’s been 17 years since Horton’s book was published. Slow Cinema is “back in fashion”, but most of the things that are out there are recycled material. It is for this reason that I try to find niches, as I did in my paper on the concentrationary universe, in which I argued that there are similarities between the slowness in Lav Diaz’s films and the slowness as created through terror in concentration camps. Slow Cinema really needs some original research, and I’m hoping to contribute to this in one way or another. Back to the book, though. The second part of the book is a rather boring piece, and a waste of paper in large parts. Horton discusses five films, but he spends so much time and space on elaborate in-depth synopses that there’s little space left for a decent argument about the actual film form, or whatever it was he wanted to focus on. It is not difficult to write a ten page synopses for a two or three hour film. Everyone can do it, so while I admired Horton’s work in the first half of the book, I felt that he lost the plot in the second half. He lost his decisiveness, his sharp eye. I don’t think that an almost shot by shot description of the film is necessary for the reader’s understanding of the films. A concise synopsis would do, with an in-depth analysis of the most important sequences. Endless synopses make the reading just so boring that the reader will most likely lose interest in the films, which shouldn’t be the result of a book on Slow Cinema. It’s pretty easy to put off your audience as it is, so you have to be clever. Long synopses are not a good strategy. Overall, though, Horton’s book is decent, and a nice start on Slow Cinema. If you want an easy start into the matter, try this book. It’s cheap, too, compared to the book on Slow Cinema, which will be published next year (and which is, I think, a rip-off, as all academic books these days). Theo Angelopoulos: A Cinema of Contemplation (1997) – Andrew Horton, available on Amazon.